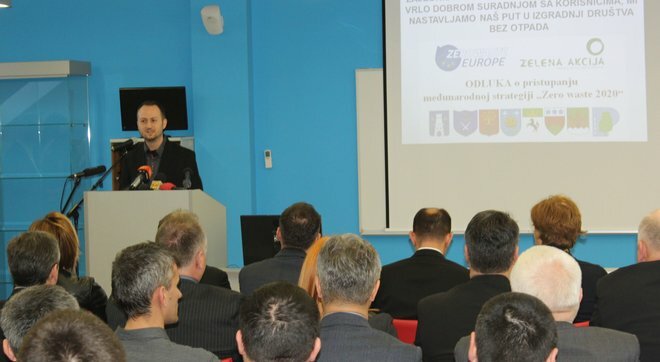 On Wednesday 24 February, representatives of the city of Prelog and six surrounding municipalities signed the European “Zero Waste 2020” strategy at a conference in Prelog organised by NGO Zelena akcija / Friends of the Earth Croatia and the communal waste company PRE-KOM. In signing the strategy, the local authorities – which are already leaders in sustainable waste management in Croatia – have committed to meet the ambitious goal of 70% separately collected waste by 2020. Attendees at the conference included Minister of Environmental and Nature Protection Slaven Dobrović, Assistant Minister Lidija Runko Luttenberger, head of the Environmental Protection and Energy Efficiency Fund Sven Muller, the Assistant Minister for Enterprise and Trade, the Head of Međimurje County, relevant Mayors, Heads of Districts, communal companies and representative of Zero Waste Europe. 18 NGOs from the Zero Waste Croatia* network were also present. After the conference the NGOs met with Assistant Minister Luttenberger on the topic of advancing sustainable waste management in Croatia. The seven local authorities in Lower Međimurje for whom Zelena akcija / FoE Croatia drew up recommendations (the city of Prelog, and the districts of Goričan, Donji Kraljevec, Sveta Marija, Donji Vidovec, Donja Dubrava and Kotoriba, with altogether more than 25 000 inhabitants) managed to separately collect more than 50% of waste in 2015. 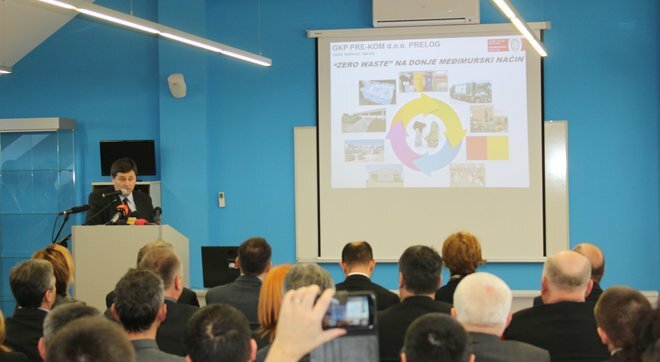 As this moved them to the top of the league tables for separate waste collection and recycling in Croatia, signing on to the international Zero Waste 2020 strategy was a logical next step. “Our wish, by accepting this strategy and implementing Zelena akcija’s recommendations, is to separately collect and treat 70% of useful waste by 2020, landfill less than 30%, and reduce the amount of landfilled waste to less than 50 kg per inhabitant per year, which is in the range of the most successful cities and districts in the world”. “Thank you for making our task easier, and that is to continue changing waste management policy in the Republic of Croatia. Until now the policy has been to mix and burn waste – thank you because you have shown that another way is possible”. “Lower Međimurje has shown that in a relatively short period of time it is possible to create a good quality waste management system and become a good example for others. I’m proud that Zelena akcija contributed to this success with its analysis. This shows that NGOs have relevant knowledge and that when the authorities are ready to listen to well-argued recommendations, significant results can be achieved”. In order to enable the commitments in the Strategy, the Lower Međimurje Waste Management Council was formed, which will include the local waste management companies along with Zelena akcija. Together with Zero Waste Europe, Zelena akcija will monitor progress towards the targets and assist with implementation of the measures to prevent, re-use and recycle waste. At the meeting of the Zero Waste Croatia network with Assistant Minister, Marko Košak, Waste Managament Programme coordinator in Zelena akcija and Zero Waste Croatia network presented the current situation with waste management in Croatia. Erika Oblak from Zero Waste Europe presented the Zero Waste Europe network and successes by particular cities and districts. Ms Luttenberger presented the priorities of the Ministry for Environment and Nature Protection with regard to implementing a good quality waste management system. The NGOs provided comments on problems with the system and suggestions for the planned new national Waste Management Plan for the period until 2021. Zelena akcija believes that the city of Prelog will achieve its ambitious targets by 2020 with the implementation of the proposed measures. We hope that other communal waste companies, with expert assistance from NGOs and support from the Ministry and Fund for Environmental Protection and Energy Efficiency, will also advance their waste management systems according to Lower Međimurje’s example and satisfy the needs of both residents and the environment. Further information on their strategy and commitments for 2020 can be found here.